Fig. 1. 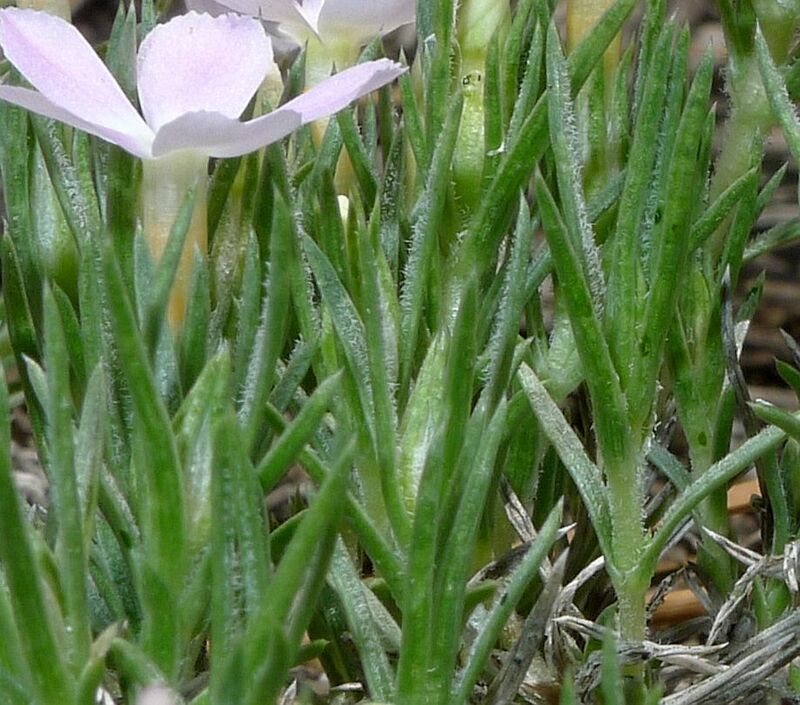 Left: Phlox austromontana from the Pebble Plains at San Bernardino Mountain. The absence of easily-visible hairs on the calyx membrane, like those of P. diffusa on the right, is obvious (but see Fig. 2 for a calyx of P. austromontana with hairs). The longitudinal ridge in its middle is more difficult to see, but the shadows reveal its presence; look for the darker side on the left of the ridge. The ridge is more prominent in the picture in Fig. 2. 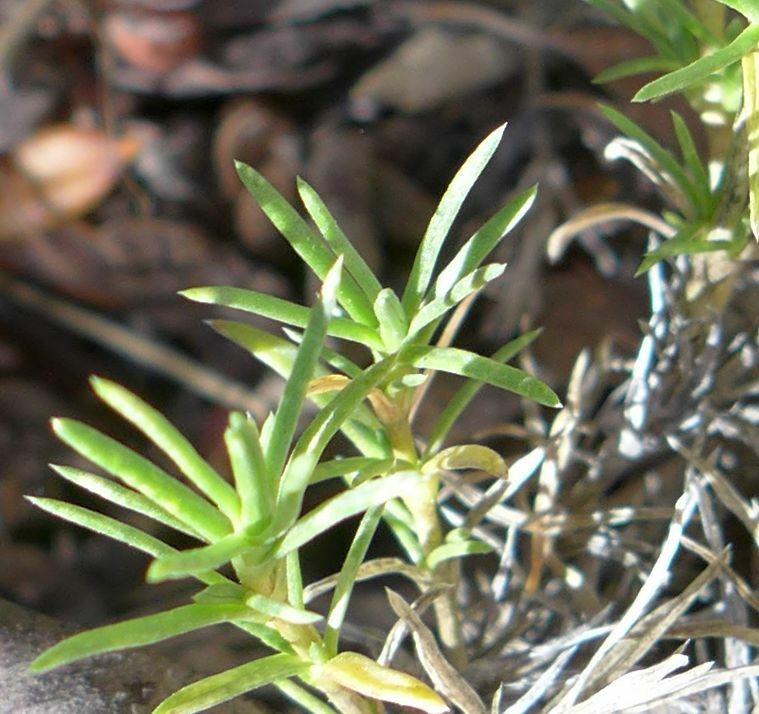 Right: Phlox diffusa from Table Mountain northwest of Wrightwood in the San Gabriel Mountains. Note the long spreading jointed hairs on the calyx membrane, that often have bends at the joints. Photographs by Michael Charters. Click on the pictures for larger versions. The species are in many cases not well defined. Some have been renamed more than once, and names are often applied to specimens not closely related to the type material on which those names were originally founded. Two sets of duplicate vouchers from the Table Mountain area of the eastern San Gabriel Mountains, northwest of Wrightwood, still have one voucher determined as one of these species, with the other voucher determined as the other species (Swinney 6248; Epling et al 5/16/1931). 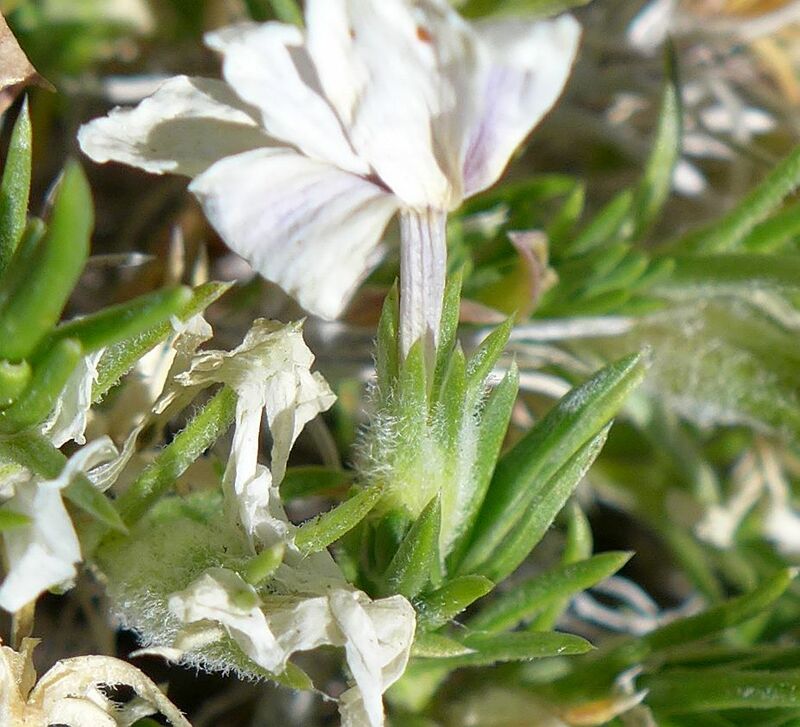 Other vouchers from Table Mountain originally determined as P. austromontana were redetermined as P. diffusa by the Phlox expert Carolyn Ferguson in 2011. 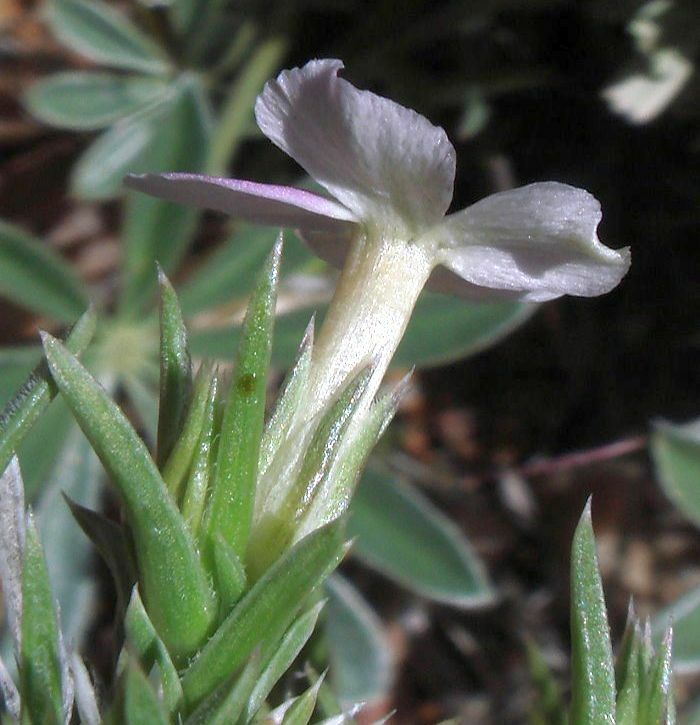 The 1951 Flora of Arizona had both species in it, but the 2005 Phlox treatment in the Vascular Plants of Arizona has only P. austromontana. 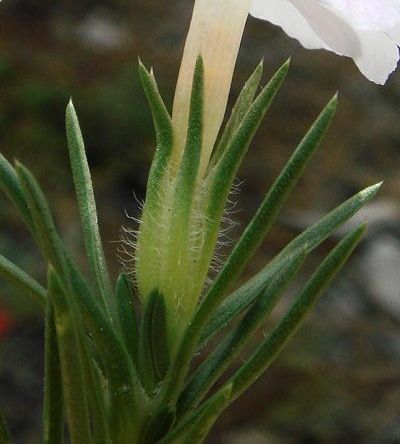 At least part of the past difficulty comes from the keys to separate them, which use how sharp-tipped the leaves are, and how keeled the calyx membrane is. These turn out to both be general characteristics, which means that one can find examples of the opposite character state in each species. Further, the leaf tip difference has been confusingly reduced to just the adjective sharp-tipped; see below for the actual differences. As a result, I was hopelessly confused in how to determine these species the first time I came across them, especially since the specimens I saw had no flowers, so all I had to work with were how sharp the leaves were. It took us a long time to figure out issues with P. austromontana and P. diffusa.... I think the situation is actually pretty clear now in that area. To zero in on a somewhat qualitative way to tell these apart, I’ll point you to the calyx. In P. diffusa, the membranes joining the calyx lobes will generally be flat (maybe wrinkled, sometimes with a hint of a fold, but pretty delicate); and the membranes in particular will have long, spreading, jointed hairs (these hairs are sometimes but not always on the lobes as well). In P. austromontana, the membrane is definitely plicate/keeled—it has a ridge that is strongest toward the base of the calyx (the membranes don’t bulge as in some other taxa, but the strong keel is generally very distinctive). Furthermore, there generally aren’t hairs at all on the membranes in P. austromontana; and the hairs on the calyx (when there are hairs externally) are not the long, spreading, jointed hairs of P. diffusa, but are short and stiff and somewhat appressed. I think looking at those characters will allow you to start to differentiate these taxa, and then it will be easier to see other differences as well (e.g., the leaf and calyx apices of P. austromontana are more pungent, while P. diffusa is “softer,” etc. ; habitats are different, etc.). 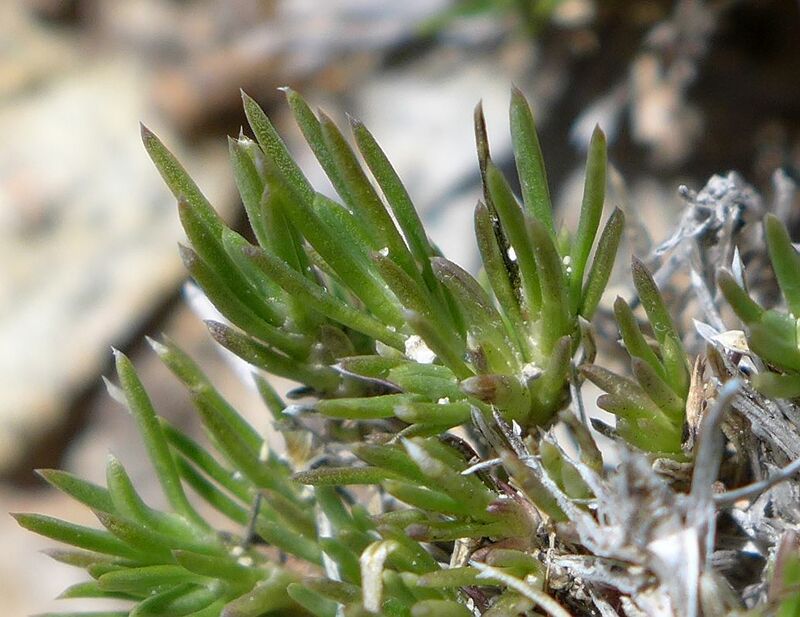 Of course, there are lots of variation within these taxa across their distributions, but these particular characters hold pretty well (austromontana in some areas can have some hairs suggestive of diffusa, but they are concentrated toward the tips of the lobes, etc. ; each is more glabrous in some areas than in others, etc.). This was wonderful! For the first time, I could actually tell the difference between the taxa. In no time at all, Michael Charters produced the photographs in Fig. 1 which clearly discriminated these species. And as Carolyn pointed out, I eventually could see the difference in the leaves as well. Time and effort often brings better understanding to problematic species; I deeply appreciate the work of Carolyn, and her collaborator Mark Mayfield, in figuring out the differences between these two species. The rest of this page details the differences that I know about in the southern California populations of these two species. As Carolyn points out, plants outside of southern California may show additional variation. 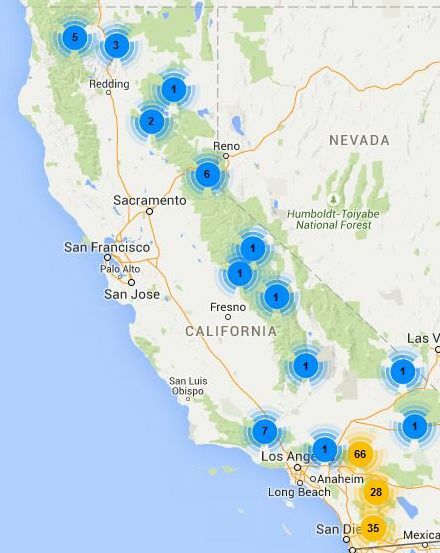 I also include maps of their geographic distributions in California from vouchers. The photographs on this page appear to show that the corolla tube is more slender relative to the calyx for P. diffusa, but I have very little data on whether this is true in general. Leaf lengths may range to larger values for P. austromontana, but the difference seems small enough to not be very useful for determination. 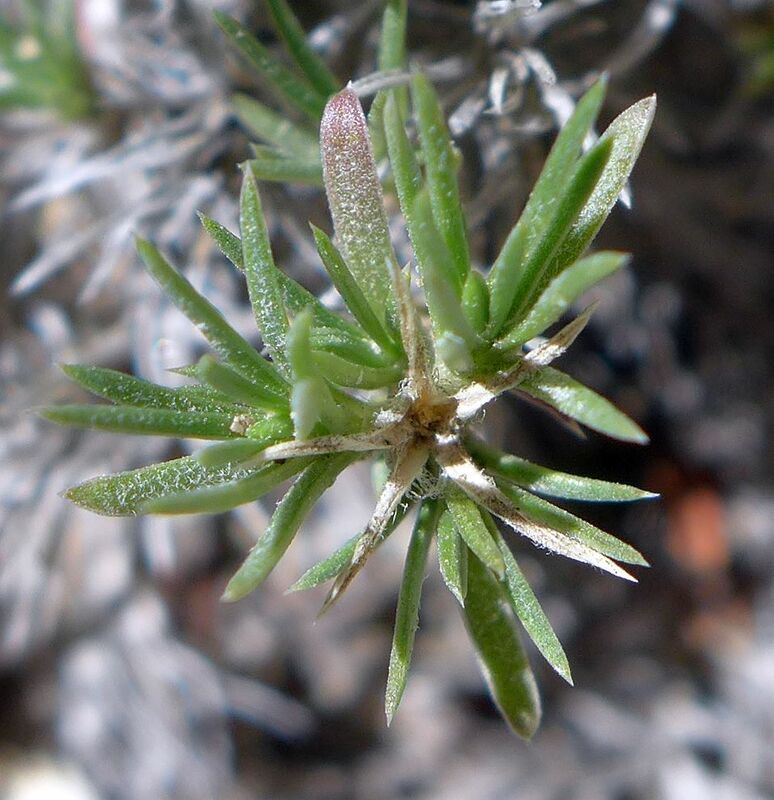 I measured a range of 6.5 to 17 mm for plants of P. austromontana in the Van Dusen Road area of the San Bernardino Mountains, and 6 to 12 mm for plants of P. diffusa from that area. For comparison, Munz gives leaves mostly 12.5-25 mm for P. austromontana, and 8-15 mm for P. diffusa in his key to separate them, but clearly these ranges are not correct for the plants in the Van Dusen Road area, and use of that key would lead to a wrong determination for the P. austromontana plants there. The 2012 Second Edition Jepson Manual treatment gives 10-15 mm for both species, which somewhat underestimates the actual range in leaf lengths. As shown in Fig. 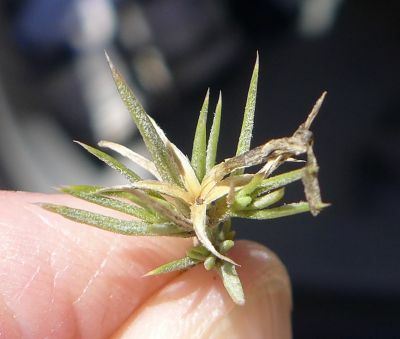 1, there is usually a dramatic difference in the calyx hairs between the two species. 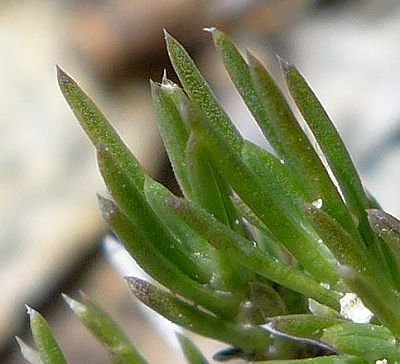 However, as Carolyn mentioned, the calyx of P. austromontana can also have dense hairs, but they are shorter and somewhat appressed. Fig. 2 shows a hairy calyx from P. austromontana plants from the Sawmill Trail at Santa Rosa Mountain, compared to another pix of the hairs from the P. diffusa plants at Table Mountain with hairs shorter than on the calyx shown in Fig. 1. These are the closest examples I know of, although I do not have many pix of the flowers showing the calyx. Fig. 2. Left: Phlox austromontana from the Sawmill Trail at Santa Rosa Mountain. 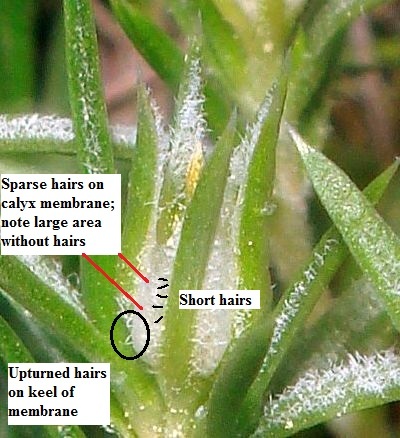 Note that the hairs are short (black lines show the length of some of the hairs); only sparsely cover the membrane; some of the hairs have upturned tips; and that the calyx membrane is strongly keeled. Right: Phlox diffusa from Table Mountain northwest of Wrightwood in the San Gabriel Mountains. 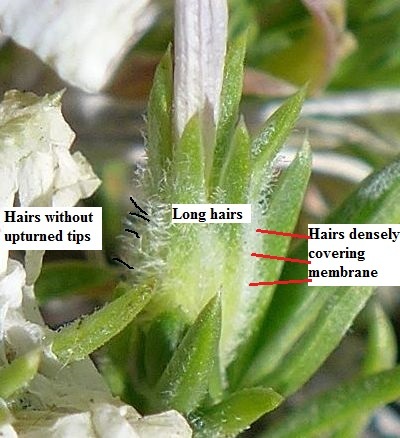 The hairs are almost twice the length of the hairs of P. austromontana; they densely cover the membrane; none of the hairs have upturned tips; and the calyx membrane is not strongly keeled. Click on the pictures for larger versions without the labels. In Fig. 2, it might be a little harder to distinguish the two species using just the hairs. As Carolyn pointed out, the hairs on the calyx membrane of P. austromontana are not as long, not as spreading, and tend to be curved up. Fortunately, the calyx membrane in this case is distinctly keeled, leaving little doubt that this plant is P. austromontana. 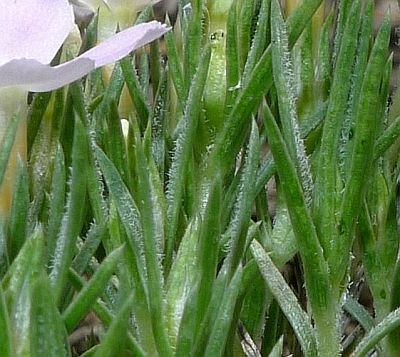 The hairiness of the leaves, and the shape of the leaf tips, confirm this determination as well (see below). 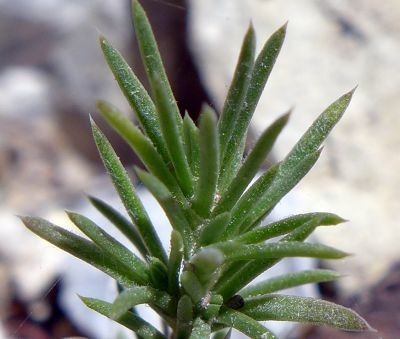 The upper surface of the leaves for P. austromontana seem to always have dense white hairs. 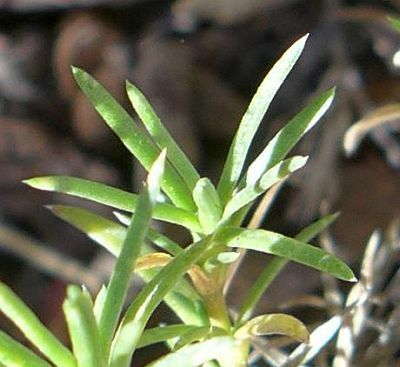 Most of the leaves of P. diffusa have no or few hairs on their upper surface, although some have a moderate amount of hairs and might be mistaken for the leaves of P. austromontana if one just casually glances at the leaves, as I have done a few times in the field before looking at additional specimens. Fig. 3 shows some examples of the variation in leaf hairiness for both species. I have purposely placed the least-hairy leaves of P. austromontana and the most-hairy leaves of P. diffusa in the bottom row, for a worse-case comparison. Although at first glance these two specimens look similar, all the leaves of that P. austromontana specimen are hairy, whereas many of the leaves of that P. diffusa specimen are not. See also Figs. 1, 2 and 4. Fig. 3. 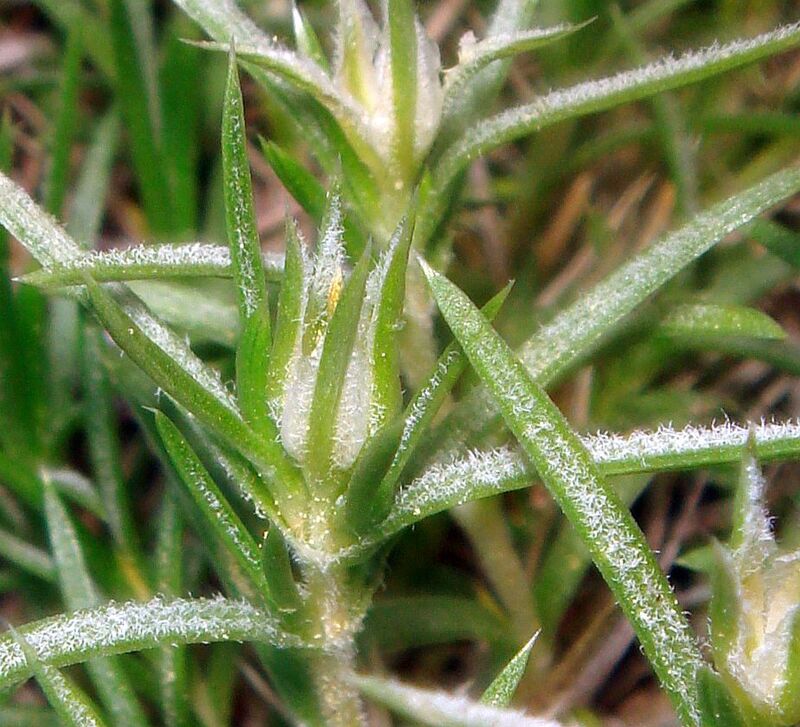 Pictures showing the hairs on the upper leaf surface. Left: Phlox austromontana. Right: Phlox diffusa. Pictures by Tom Chester except for the middle pix on the left, by Keir Morse. All pictures from Van Dusen Road or the nearby PCT from San Bernardino Mountain, except for the top left picture from the Sawmill Trail at Santa Rosa Mountain. The main body of the leaf is very narrowly triangular for P. austromontana, and nearly oblong for P. diffusa. 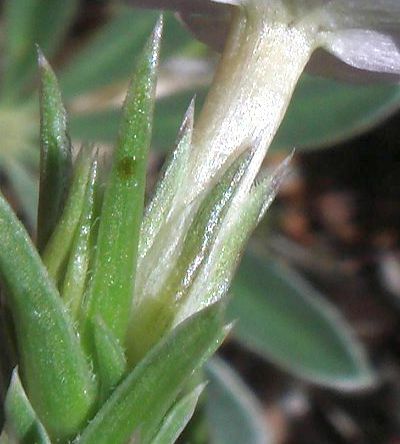 The tip of the leaf is generally gradually tapering for P. austromontana, and generally abruptly narrowed for P. diffusa. Note the use of the word generally, which just means more than half. I.e., those characteristics are not found in all leaves for either species; one has to look at a number of leaves to see how many are gradually tapering, and how many are abruptly narrowed. 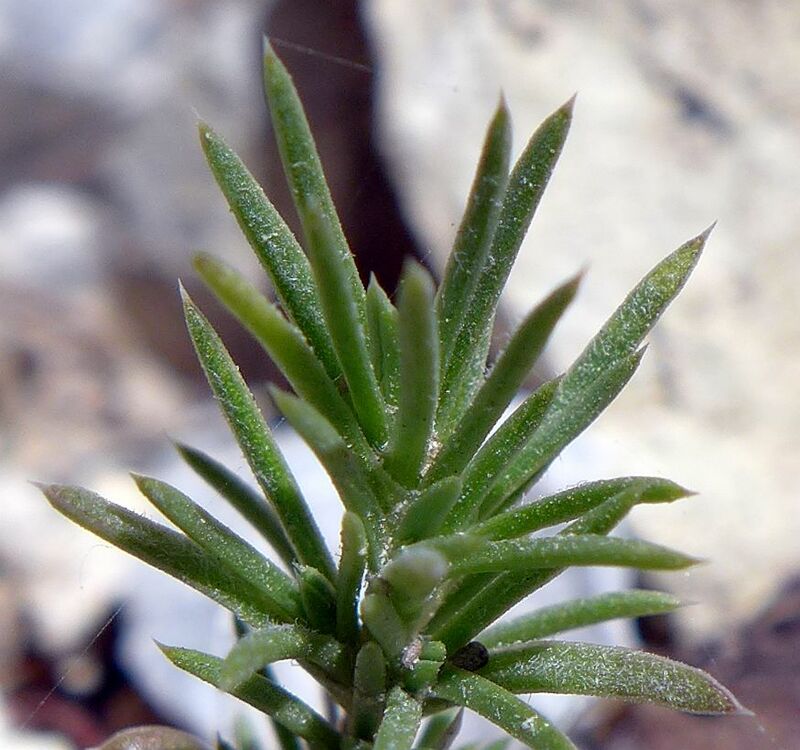 One sampling showed that 59% of the leaves of P. austromontana (25 out of 42) had gradually tapered leaves, with the other 41% of the leaves having abruptly-narrowed tips. Another sampling showed that 91% of the leaves of P. diffusa (240 out of 265) had abruptly-narrowed tips, with 9% appearing as gradually narrowed tips. If these statistics hold in general, one only has to look at 10 leaves to reliably distinguish the two species, since one would expect 3 to 9 of those leaves to be gradually tapering for P. austromontana, and 0 to 2 leaves to be gradually tapering for P. diffusa. The very tip of the leaf is tan for both species, with the tan portion being 0.5 to 1.0 mm for P. austromontana, and 0.3 to 0.6 mm for P. diffusa. Since the leaves are usually roughly the same length for the two species, the tan tip appears roughly twice as long for P. austromontana. Fig. 4 shows the leaf shapes for the two species, from plants 200 feet apart on Van Dusen Road in the San Bernardino Mountains, along with an illustration highlighting the difference in the leaves. 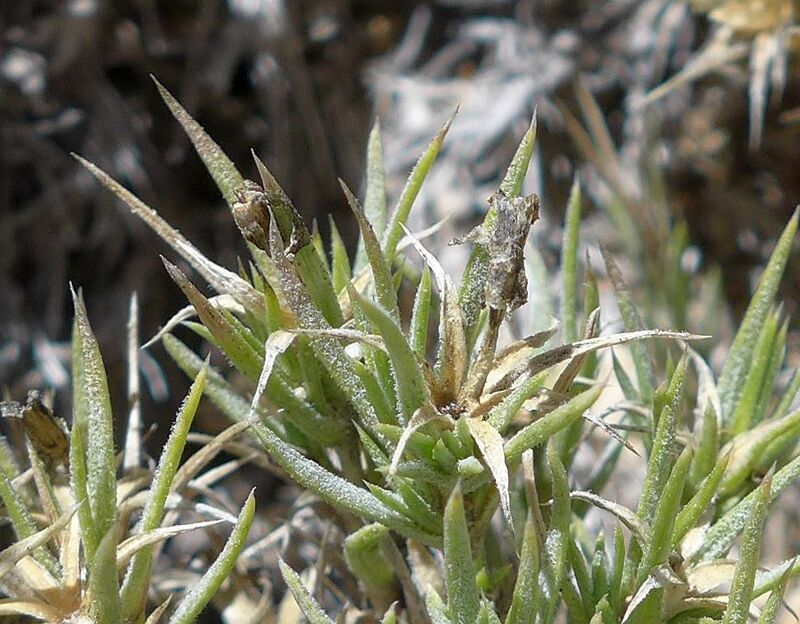 These plants were not selected to have the most dramatic differences; they were the plants at the first location where we found both species along that road. Fig. 4. Top left: Phlox austromontana. Top right: Phlox diffusa. Both plants were on Van Dusen Road at San Bernardino Mountain, just north of Big Bear Lake, separated by just 200 feet. Bottom: illustration of the leaf differences. Click on the pictures for larger versions. 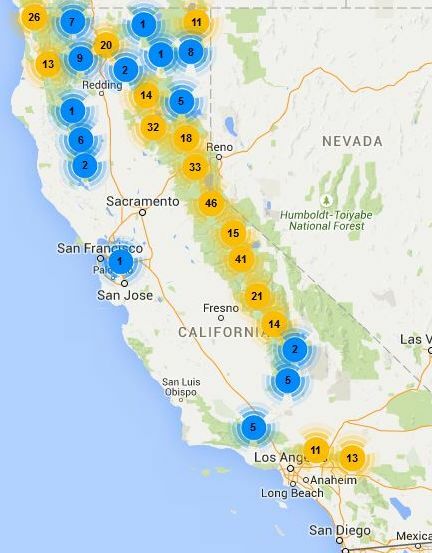 The voucher distribution of these two species, as given by the clustering algorithm of the Berkeley Mapper at the Consortium of California Herbaria for georeferenced vouchers, retrieved on 1 August 2015, is shown in Fig. 5. Fig. 5. 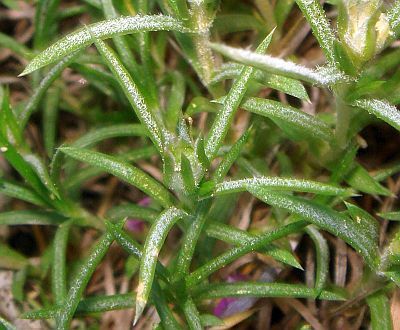 Voucher distribution of Phlox austromontana (left) and Phlox diffusa (right). The numbers in the circles are the number of vouchers (including duplicate vouchers) within a small distance from the center of each circle. I consider it to be highly probable that the blue circles in the distribution for P. austromontana are misdetermined vouchers of P. diffusa, and hence the true geographic distribution for P. austromontana is probably that shown only by the yellow circles. 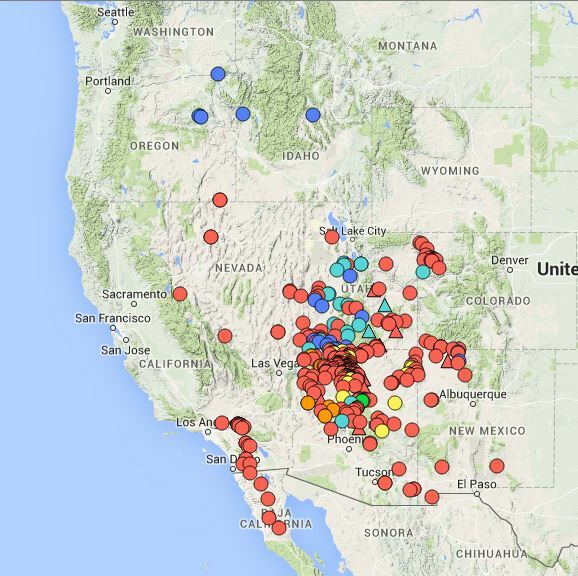 Vouchers for P. diffusa are all in the San Gabriel and San Bernardino Mountains and north. Vouchers for P. austromontana are almost entirely on the eastern side of the San Bernardino Mountains and the Peninsular Range. This fits with its distribution in the rest of its range, which is concentrated in Utah and Arizona to the east and northeast (see SEINet distribution map; the different colored symbols on that map are different subspecies of P. austromontana). There are a small number of scattered vouchers of "P. austromontana" from P. diffusa territory. It seems most likely that those scattered vouchers are all misdetermined specimens of P. diffusa. 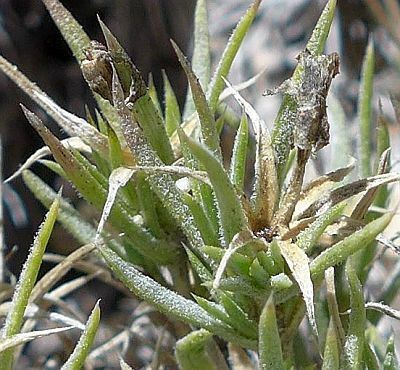 There are 21 georeferenced vouchers of P. austromontana from the Sierra Nevada and north, compared to 354 georeferenced vouchers of P. diffusa. If all these vouchers are actually of P. diffusa, it would take only a 6% misdetermination rate to produce the 21 vouchers of "P. austromontana" in that area. 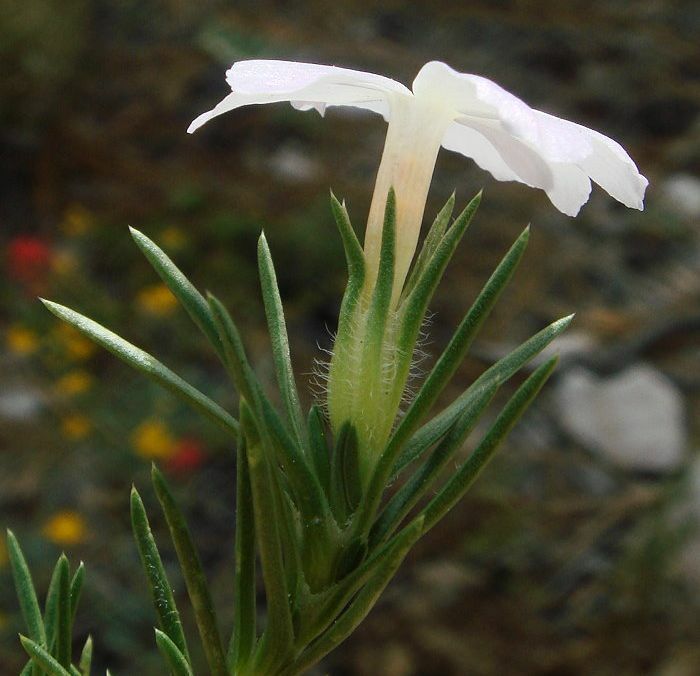 Phlox diffusa appears to be almost entirely a limestone / dolomite endemic in the San Gabriel and San Bernardino Mountains. All locations I know of for that species in those two areas are on limestone or dolomite, except for a single plant on what appears to be schist on the Blue Ridge Trail, and probably Swinney 5632 and Peirson 3179, also from the Blue Ridge. 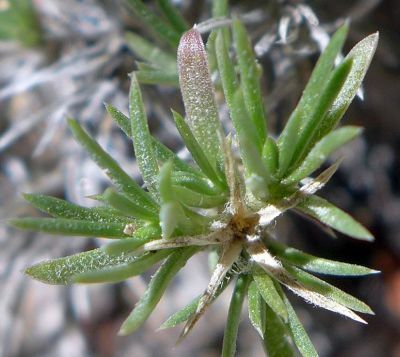 P. austromontana is also found on limestone / dolomite in the San Bernardino Mountains, but is found on other substrates in the Peninsular Range. I thank Carolyn Ferguson for the information about how to reliably separate these species, which stimulated this entire page, and for her review of this page for accuracy.